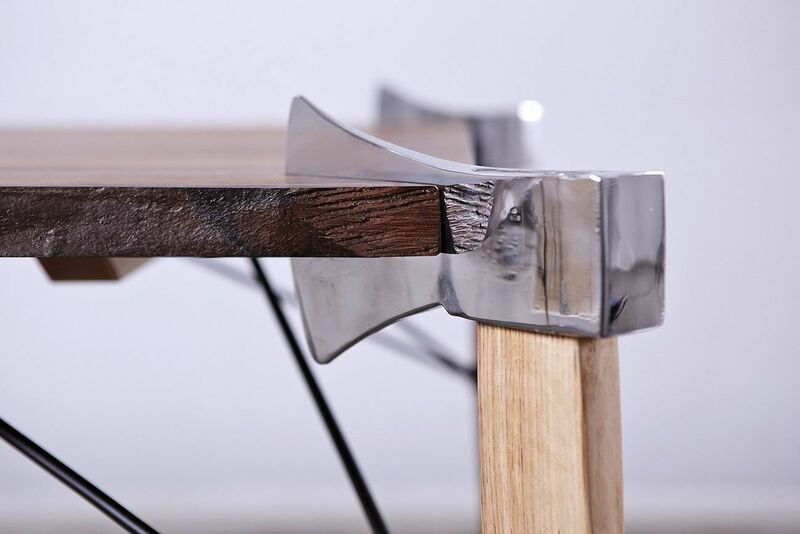 Four razor-sharp-looking axes slice through a solid sheet of wood to form the legs of this highly unusual table inspired by the Brothers Grimm tale, “Little Red Riding Hood.” The ‘Woodsman Axe Table’ by Duffy London certainly makes a strong (and somewhat frightening) statement that would make the Big Bad Wolf think twice about messing with you. 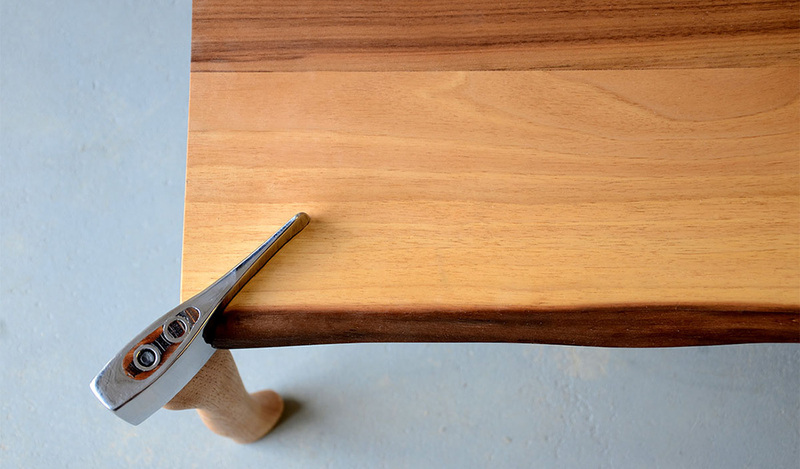 Reclaimed axes with solid hickory handles were imported from the United States and polished to a mirror finish to make them even more eye-catching as the corner pieces on the unique table. 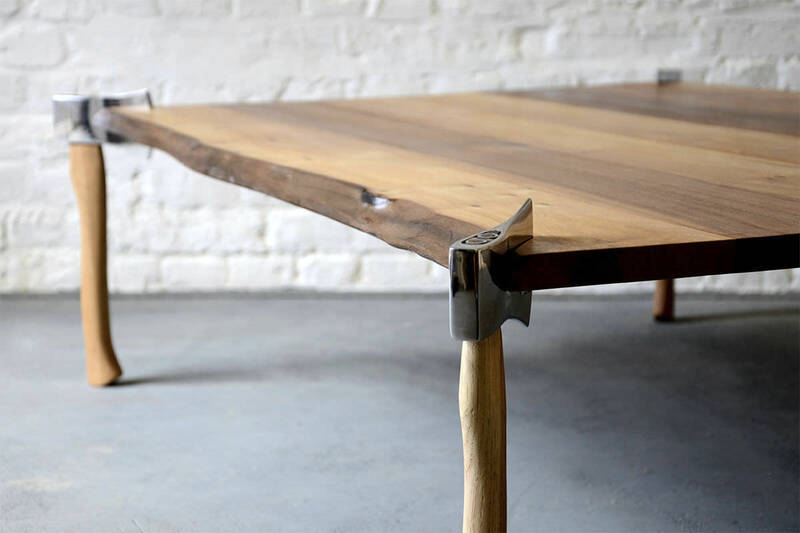 Hopefully those axes aren’t actually as sharp as they appear, for the sake of your own safety and that of your guests, kids and pets – but then again, the sight of this table in your living room could scare away any potential invaders. 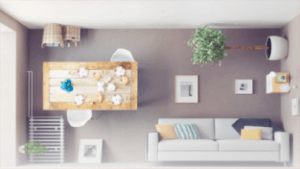 The concept is certainly unusual and the design perhaps likely to drum up some controversy among your guests, but one of the best things about the Woodsman table is the fact that it would be equally at home in a log cabin or a modern apartment. It’s a cool piece of sculptural furniture that doubles as art. 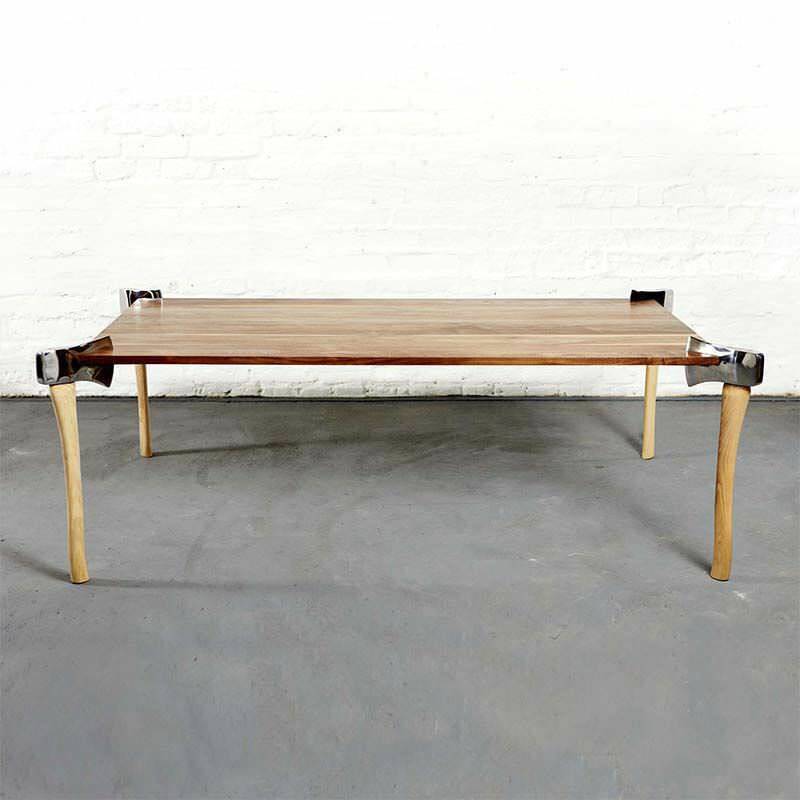 Conceived as a one-off display piece, the Woodsman Axe Table is now available through the designers’ website for £895.00 with walnut, light oak and ash surface options. The project won the Peta Levi Memorial Bursary 2010 Award as part of the Grimm Design Collective and measures 40 cm (15.7 inches) high, 120 cm (47 inches) long and 80 cm (31.5 inches) wide. Turnaround time is 8 to 12 weeks. Duffy London is known for its playful iterations of common furniture items, like glass table surfaces held up by (sculptural) balloons, layered wooden tables filled in with blue resin for an effect that’s like gazing into a dark abyss and glass that’s seemingly supported by a cascade of wooden monoliths that could fall over and cause a spectacular crash at any moment. Check out Duffy London’s Transforming Table, suspended chairs surrounding a rectangular bar and optical illusion silhouette chairs.